When 40 Latino high school students were asked if they were familiar with Landscape Architecture (LAR) as a career, not one student raised her/his hand. Landscape Architecture is a discipline that is ripe for selection as a potential career, but has not registered as a choice with Latino High School students. 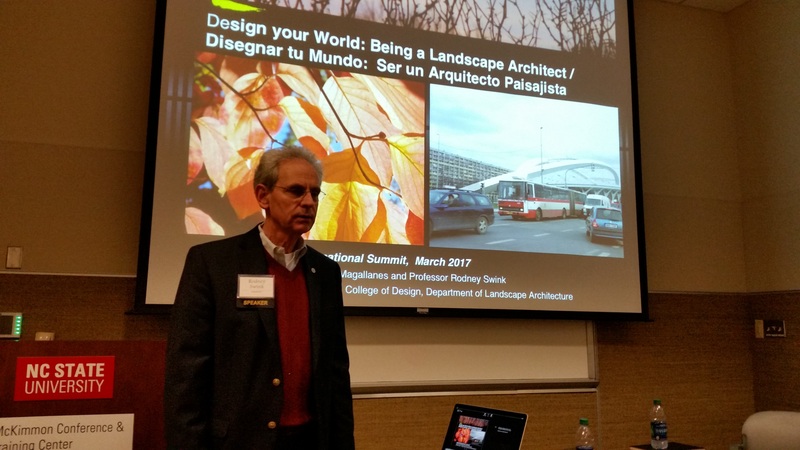 North Carolina State University College of Design Landscape Architecture professors Fernando Magallanes and Rodney Swink started to break down this career barrier. The opportunity to take this step towards making Landscape Architecture more visible to Latino students came when their abstract was accepted to speak at the Annual Hispanic Educational Summit at the NCSU Mckimmon Center March 31, 2017. Magallanes and Swink see this as their first step in recruiting, educating, and informing young North Carolina Latino high school students about the importance of Landscape Architecture and about emerging opportunities that it offers as a career. Last December, Magallanes and Swink targeted this major event by submitting their abstract in a call for presentations. 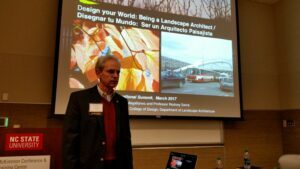 Their talk- Designing your world: Becoming a Landscape Architect was accepted and given a 40-minute presentation slot to present and inform the group about Landscape Architecture. 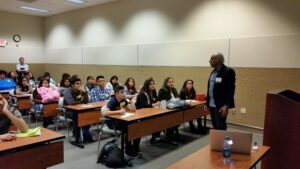 They addressed 40 students who were part of an even larger community of Latinos from the 24 counties represented. The sponsor of the summit, NC Society of Hispanic Professionals (NCSHP) has invested many years in exposing and introducing Latino students to college admissions issues, college requirements, and career opportunities. NCSHP has continuously presented traditional areas of hispanic interest such as Engineering, Mathematics, and Education, but now they are trying to introduce emerging and creative disciplines like Landscape Architecture. As a growing demographic of approximately 900,000 documented Latinos in NC, Latinos are seen as major contributors within their communities. Their importance is clearly noticeable enough to attract Margaret Spelling, President of the University of North Carolina System, to open the 18 th Hispanic Educational Summit. Magallanes and Swink believe there should be a parallel increase in Latino representation at North Carolina Universities and also gain a larger presence at the College of Design. Latino leadership in Landscape Architecture and design related fields in general is low and national organizations like the American Society of Landscape Architects (ASLA) has started making a conscious effort in attracting Hispanics. The ASLA has recently hosted summer seminars for young practicing Hispanic designers inviting them to inform ASLA about how to attract high school and college students into the discipline. As a Latino Landscape Architect, Magallanes hopes that more Latino designers and leaders can actively contribute to a more diverse represenation in public, private, and civic level designs. Magallanes and Swink left the Summit very encouraged by the interest of the students as well as that expressed by several NCSHP Board members including NCSHP founder Marco Zerate. Magallanes and Swink observed a lack of design presence in the Summit but feel that there may be possibilities of inviting A&amp;E firms in the Triangle and NC State University Landscape Architecture students and other designers to present their works and interact with Hispanic students. Magallanes and Swink agreed to submit another abstract for next year’s Summit involving participation of more designers. Well written, to the point, and informative. Very nice and encouraging to those seeking diversity both educationally and geographically (Latinos and all others).